UPC barcode numbers are not random numbers chosen by a brand owner, but a string of numbers which adhere to global standard to enable products to be sold worldwide. To ensure authenticity and to prevent duplicate UPC barcodes from being assigned, the data in a UPC barcode must contain a UPC (GS1) Company Prefix issued by GS1 to a specific brand, an Item Reference Number assigned by the brand owner, and a Check Digit which is mathematically calculated. The Barcode FAQs below will provide the necessary answers to enable your company to properly barcode your items. Retailers and online marketplaces, such as Amazon, Wal-Mart, Macy’s, Kroger, Target and many others, require suppliers have a GS1 Company Prefix issued to them, in order to do business with them. The UPC barcode GS1 Company Prefix provides assurances to retailers of the legitimacy of the UPC barcode data. As part of the onboarding processes for new suppliers, retailers (and Amazon) validate a brand’s provided UPC barcode data against the GS1 data registry. In addition, the GS1 Company Prefix is also used for case markings and even coupons. If you do not yet have a licensed Company Prefix, please CLICK HERE to get started..
Our certified Standards and Barcode Professionals assist and educate thousands of companies each year with item identification and will ensure your UPC barcodes are properly assigned, created, and registered in global product databases. For additional information, click here. How come I see discount UPC barcodes advertised online? Be very wary of website offering “cheap” UPC barcodes. Purchasing UPC numbers from another company goes against the global standards used by most retailers, distributors, hospitals and online marketplaces (i.e. Amazon). The companies who solicit these “cheap” UPC barcodes, are providing their clients UPCs with a common GS1 Prefix. This is problematic for major retailers and online marketplaces. Due to extremely low prices, many companies are enticed to go with the more economical route. Unless you are only selling on your own website or to a few local stores, these UPCs will limit where you can sell your products. Many UPC resellers who advertise on search engines are not reputable companies and intentionally attempt to confuse companies who are not familiar with how UPC barcodes work. It is highly recommended that you discuss the use of these “inexpensive” UPCs with your potential trading partners and fully understand the limitations. Is purchasing a single UPC from a reseller legal? Marking a product with UPC barcode is not a legal requirement, it is a trading partner requirement, which means the company who is requiring a UPC barcode symbol on items being sold is responsible for ensuring UPC compliance. Many large retailers, grocery chains, and distributors explicitly state in their Supplier Requirements that suppliers must obtain a UPC Company Prefix from the GS1. For example; Wal-Mart, Macy’s, Kroger, Sears, SuperValue and many other retailers require suppliers to provide a copy of their GS1 Certificate during their vendor onboarding process. Other retailers, grocery chains, and distributors use an online tool to verify UPC ownership. Does Amazon allow suppliers to use barcodes obtained from a UPC Reseller? No, Amazon explicitly states on Seller Central that UPC barcodes must be obtained from the GS1 and be registered on the GS1 Data Hub portal. Please note in the past Amazon did not require suppliers obtain UPC codes from the GS1, and accepted UPCs from any source including UPC resellers. However, in June 2016, Amazon updated their policy regarding UPCs and now requires suppliers’ only use UPCs which contain a GS1 Company Prefix issued to the supplier’s company name. “We verify the authenticity of product UPCs by checking the GS1 database. UPCs that do not match the information provided by GS1 will be considered invalid. We recommend obtaining your UPCs directly from GS1 (and not from other third parties selling UPC licenses) to ensure the appropriate information is reflected in the GS1 database. How Do I Determine How Many UPCs to Buy? Companies technically do not “buy” UPCs, but rather license a GS1 Company Prefix. The Company Prefix enables a company to create the UPC barcode numbers (aka GTINs). The length of a Company Prefix will determine how many GTIN assignments can be created. Consequently, you will license a GS1 Company Prefix to create assignments in 10,100,1000, 10000 and 100,000 blocks. The pricing of the GS1 Company Prefix is dependent on how many UPC assignments (GTINs) you will need. 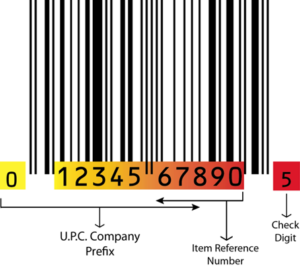 Every product requires a unique UPC barcode assignment (GTIN) so companies need to take into consideration every variance of size and color. For example, if you have 15 items and each item can come in one of six colors. You will need to create 90 GTINs (15 x 6). What happens if I assign all my GTINs available with my GS1 Company Prefix? It is very common for companies to grow beyond their available GTINs, so additional GS1 Company Prefixes can be obtained. For example, if you currently only have 5 items and think it will take a few years before you triple the number of products you offer, you can obtain a GS1 Company Prefix now which provides you 10 GTIN assignments and license an additional GS1 Company Prefix in the future. 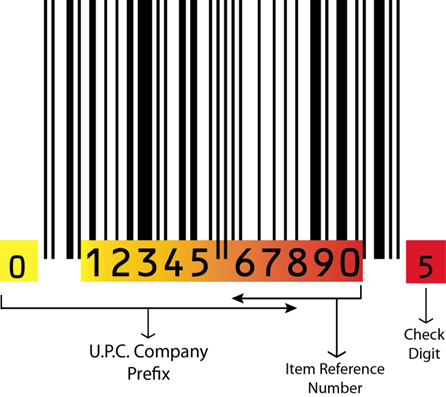 For additional information regarding UPC barcodes, we suggest reviewing the following article we have posted on our blog; Bar Coding Facts; Getting Your Products Labeled Properly . Frequently Asked Questions about the GS1 Barcode Service can be viewed at https://www.barcode.graphics/gs1-barcode-service-faqs/.